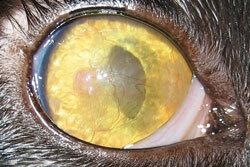 Eosinophilic keratitis is an inï¬‚ammatory condition that affects the cornea and/or conjunctiva. The characteristic appearance is white, tan or pink roughened plaques on the corneal surface. These plaques are composed of inï¬‚ammatory cells, including a specific type called eosinophils. The cause of eosinophilic keratitis is believed to be related to an underlying feline herpesvirus infection and/or an autoimmune reaction. This disease is progressive and can grow to involve the entire surface of the eye causing blindness and discomfort. Often it is initially detected in one eye; however, the disease may progress to involve both eyes. Corneal cytology performed on a sample obtained from the corneal surface is usually adequate to obtain a diagnosis, which is conﬁrmed by the presence of eosinophils under light microscopy. Occasionally, microscopic examination is not sufﬁcient for diagnosis and further diagnostics may be recommended. Due to its suspected association with feline herpes virus (FHV-1), diagnostic testing and/or empirical treatment for herpes virus may also be indicated. Treatment for eosinophilic keratoconjunctivitis consists of topical anti-inﬂammatory medications and/or systemic hormonal modiﬁcation. Ovaban (megestrol acetate) is a synthetic progesterone (hormone) used to treat this disease. It is very effective, but does have possible side effects, which may include transient diabetes mellitus, enlargement or (rarely) cancer of the mammary gland, and liver toxicity. The length of treatment is variable and some cats may have disease recurrence when medications are discontinued. The majority of patients can remain comfortable and visual when medical therapy is continued long-term. Life-long treatment is often necessary. Generally the initial course of topical or systemic therapy is tapered to the lowest effective dose and frequency for long-term care and maintenance.